SOLD- WAS: $50.00 NOW: $35.00 These breathtaking vintage earrings are unsigned, however they should be! They are constructed so well and they have a quality look and feel. Not only that, they were made with the same patented clips that Miriam Haskell used. The famous US patent number 3,176,475 that was awarded to AroSac appears on the round portion of the clip. I don’t know who designed or manufactured these beauties. 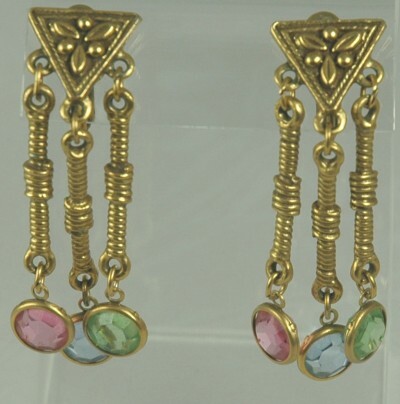 Three dangle drops of twisted Russian gold- tone metal are finished with bezel set glass in pink, blue and green. These dangles hang from a beautiful triangle with a raised design. Condition: Excellent vintage. Minor wear under the clips that is consistent with age. Measurements: 2 1/4" total length.